Happy 2014! Hope your holidays were filled with great food and loved ones who weren’t too annoying. 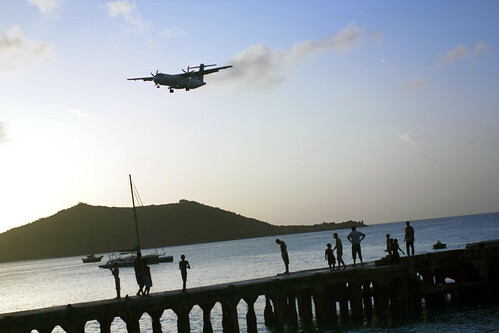 After Christmas, David and I jetted off to St. Martin. You may recall all the Switzerland posts earlier this summer. Well, that Swiss trip wasn’t all for “fun.” Sadly, the BF moved to Zurich a few days ago because of a new job. So before the move, we thought a little sun and quality time was in order. 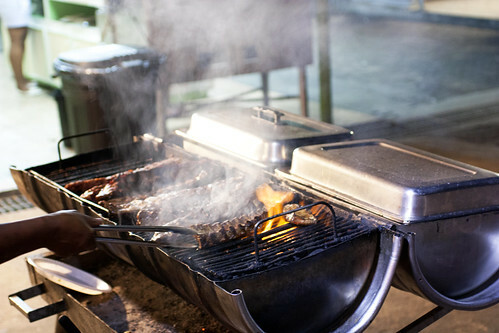 In St. Martin, “lolos” or local roadside barbecue stands can be found everywhere you go. The first night, we ended up at the Rib Shack (Lolo #6) overlooking the water in Grand Case. We ordered a few things, but the standout were the ribs, which were highly spiced, wonderfully crisp all around, and smokey from the grill. When we got there, they said the ribs would take some time, but I’m glad we waited. It was completely worth it. And if you didn’t know, $1.50 beers make the time go by really quickly. 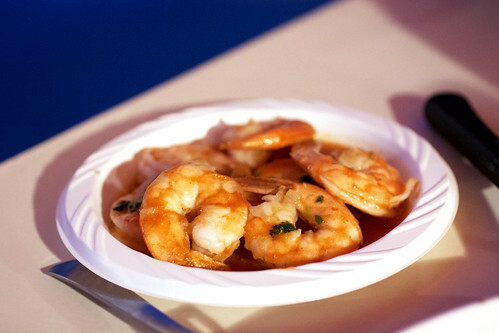 Unfortunately, they were out of fish and lobster, so we ordered some Creole shrimp, which were just shrimp in a bland, watery tomato-based sauce. I’d skip these next time. Stuffed christophine or chayote stuffed with bread crumbs with lots of dried herbs was decent but passable as well. French fries, on the other hand, were addictive. While thick-cut and not extremely crunchy, the fries were freshly-fried and meaty. The total for everything along with 2 beers and a water was €26. However, while the island currency is the Euro, the conversion was 1:1. (This is the case at lolos and many restaurants on the island.) Definitely not bad for a meal for two with a view of the sun setting into the ocean. Again, Happy New Year! The year is starting a bit blue for me with David gone, but 2014 is looking to be an adventure. Fasten your seat belt. Life is a bumpy ride.